Sam Ford playing Bernard Parham in a blitz battle during a tribute to Parham at the Gary Public Library. Gary, Indiana is most famously known as the hometown of the famous Jackson 5 which featured megastar Michael Jackson. Gary was a place of refuge for many southern families looking for opportunities in the north. However another refuge as been found in chess as the state has had a long history. Leroy Muhammad, a St. Louis legend, has been a resident in Gary, Indiana for several years. 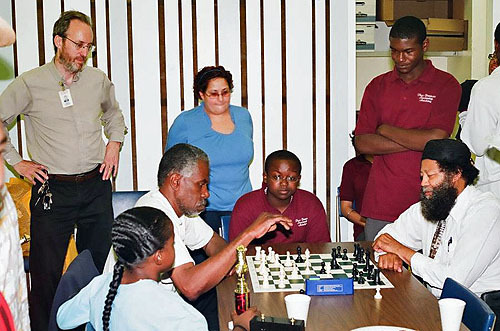 He has informed The Chess Drum that he will host monthly tournaments. 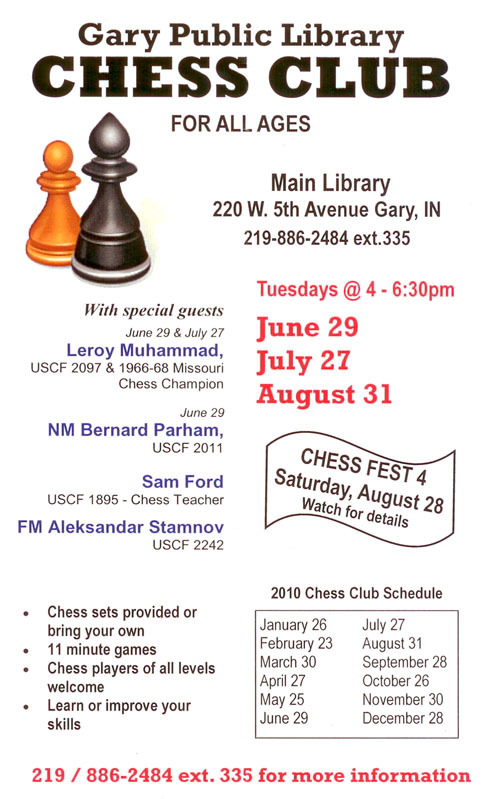 The next event will take place on July 27th at the Gary Public Library. Some of the players will be Bernard Parham (2.Qh5 fame), blitz legend Sam Ford and FM Aleksandar Stamnov.